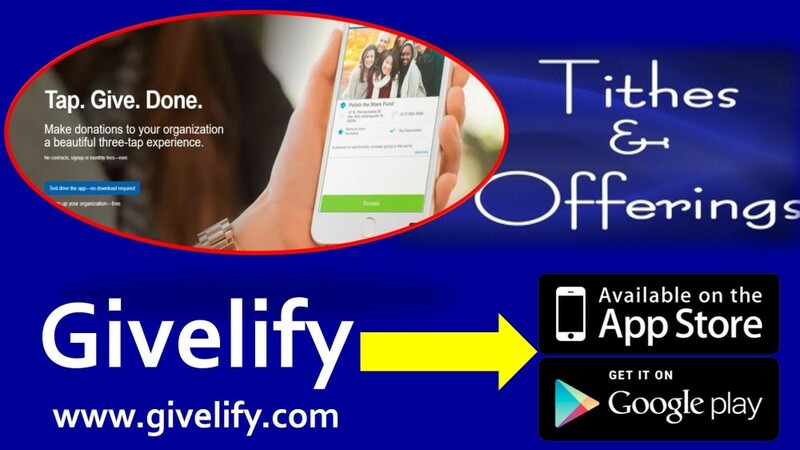 In addition to traditional giving of tithes, offerings, and donations by cash, check, and money orders, FMBC accepts contributions through the GIVELIFY (app)lication. You can set up options for one-time or recurring contributions, not only to your church but other non-profits, charities, etc. It's easy to donate to different FMBC ministries and programs with just a few clicks. Access to your giving history for tax purposes is always at your fingertips, so there is no need to track down receipts or statements. Information on GIVELIFY can be found online at www.givelify.com -- and you can take a "test drive" to familiarize yourself with the features -- but the app actually runs on iOS and Android mobile devices. Go to the app store on your device(s), install GIVELIFY, identify FMBC, connect your account to your bank, and you're all set. You'll receive an email with each contribution and you can check your giving history on the app anytime! It's so convenient: you can present your offerings from your pew seat or 1,000 miles away.